You can insert videos in the body of your Help Center knowledge base articles. Your videos must be hosted on a third-party video hosting service. If you prefer not to host your videos on a public service, refer to Embed videos in two easy steps using video.js for another solution. If your video is hosted on one of the supported video hosting services, you can use the article editor toolbar, as described in this article, to insert the video. If your video is hosted on another service, you must manually add the embed code to insert the video. If you are using Web Widget on your website or Help Center, your end-users can stream videos in Help Center articles directly in the Web Widget. To display correctly in the Web Widget, videos must be publicly available, and hosted on one of the supported third-party services. Copy the URL for your video. Your video must be hosted on Vimeo, YouTube, Wistia, JWPlayer, or Brightcove. If your video is on one of the supported services, you can use this procedure to insert your video. You do not need to enable the option to allow unsafe content in your Help Center to do so. Note: If your video is not hosted on a supported provider, click the Source code button to manually add your embed code. In that case, you must allow unsafe HTML (see Allowing unsafe HTML in pages). In Help Center or Guide Admin, edit an existing article or create a new article. Place your cursor where you want the video to appear, then click Add video on the editor's toolbar. Paste the video's URL in the dialog box. A preview of the video appears. I have followed your instructions in this article (including enabling unsafe html), and I am able to see the videos displaying (and playing correctly) as I post my article from the agent's editing mode. However, after my article is posted, my article appears with only text (no video) from both the "Show in Help Center" button and the route my customers would take. Do you have any insight into solving this problem? Your video is being stripped out because of a security settings design to prevent cross site scripting. If you trust your editors not to put bad content on your portal, you can disable the setting under: Guide settings > Security. Make sure Display Unsafe Content is checked. I've just embedded a video and it's showing up in the article but there's no sound. Is there some separate setting to make sure that sound is included when doing this? Apologies for the delayed response, but welcome to the Zendesk Community! Which third-party service are you using for the video? ok. And it's safe for me to assume you're not having any audio issues with the version on YouTube? Check to see if there are any errors displaying in the web console when the video is playing and let us know if there are. I'd also suggest removing it, saving the article, and then re-adding it back in, in case there is some kind of caching issue that's causing the problem. Glad to hear it, Jonathan! Let us know if anything else comes up. We're always here to help. , but they stay on the left. Any suggestions? I did some testing on this in my own instance but didn't have any luck getting the video centered. The only solution I can think of is to increase the size of the video itself (ie: height and width at 100%) so that it takes up more screen real estate. It may also be possible to make modifications to the embed code itself, but I don't know for certain. If make a vimeo or youtube video that anyone with the link can see, but is not available in the video platform search, will that work when embedded in Zendesk guides? I'm pretty sure that should work, but I'm checking on this for you. Standby! The official word is that it should work. As long as you're using the embed code, that gives access; the embedded video has no way of verifying identity. Give it a try and let us know if you run into any problems! Hey ZenDesk - Our videos stopped showing up in articles on 4/5 of our customer service sites and after reading your article, I noticed that the "Display Unsafe Content" wasn't checked in guide settings for these 4... not sure how that happened, and I've re-checked those boxes now... but would love to know if there's a way to get back all those embedded videos that were stripped out, without having to manually go into each and every article & add them back in? Welcome to the Zendesk Community! That does sound like a pain. I'm not certain there's an easy way to do this, but I've asked our support team to take a look. In my testing once I had successfully embedded a video in my article, then disabled the option for Display Unsafe Content, the video is displaying again after I enabled Display Unsafe Content once more. Are you not experiencing this? Thanks Nicole & James. Videos didn't seem to come back right away when I enabled "Display Unsafe Content". So I went in and manually added one back in myself... and I was waiting on ZenDesk's response before doing the rest. But then the rest of the videos came back without me having to do any further intervention... sooooo happy that this manual effort won't be necessary! Hi! 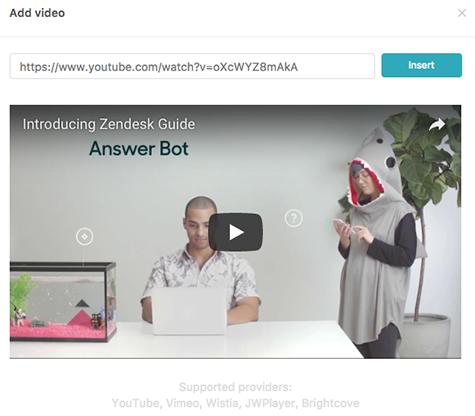 We're going to set up a Zendesk guide and would like to include video in our articles. We're questioning which third-party video hosting service to choose. Our main concern would be that we only want people with a Zendesk access to be able to access the video - so basically apply the Zendesk logins to the video hosting service. Any recommendations about this ? Thanks! I don't have any recommendations for you beyond what is listed in the article. However, I see that this is your first post and wanted to welcome you to the Zendesk Community! I encourage you to head over to the Welcome Thread in The Lounge to introduce yourself. Is there a way to make videos responsive so the size adjusts with a change in window size, and for mobile web? At the moment, there is not. However, I encourage you to suggest it in the Product Feedback topic. We host our videos on Wistia and have them set to auto play, however, when I upload them to an article in Zendesk, some videos play automatically and some do not. Any reason? Is there something in the code I can toggle for the ones that don't auto play? Hi Katie! Welcome to the Community! My educated guess is that there's a code snippet that makes that determination, and whether that code snippet appears depends on the settings on the video when you generate the embed code block in Wistia. But that's just a guess. Would you be able to post the code for a video that auto-plays, and a video that does not? Maybe we can figure out what's going on buy doing a side-by-side comparison. I'm thinking this has something to do with me sharing the article to a different section. I've compared each code and can't see a difference. I've also checked my settings in Wistia and they're set to auto play. I tried embedding the code you have offered and was unable to find the videos you referenced in order to test. I would like to spin up a ticket and see if there is additional information I can gather for testing purposes. You should be getting a notification from me shortly. I'm trying to a video that is currently hosted on JW Player, but none of the JWPlayer URLs are working to add a video with the supported integration. Can you advise what the supported URL path is for JWPlayer videos? Currently, I'm only able to add my JWPlayer hosted video by adding an iframe to the source code. Just an FYI that we added Vidyard as a supported video hosting service and I updated the list of supported providers in this article.